One of the nice things about being based in the UK is that we have had more time to do a lot more exploring of my home country. 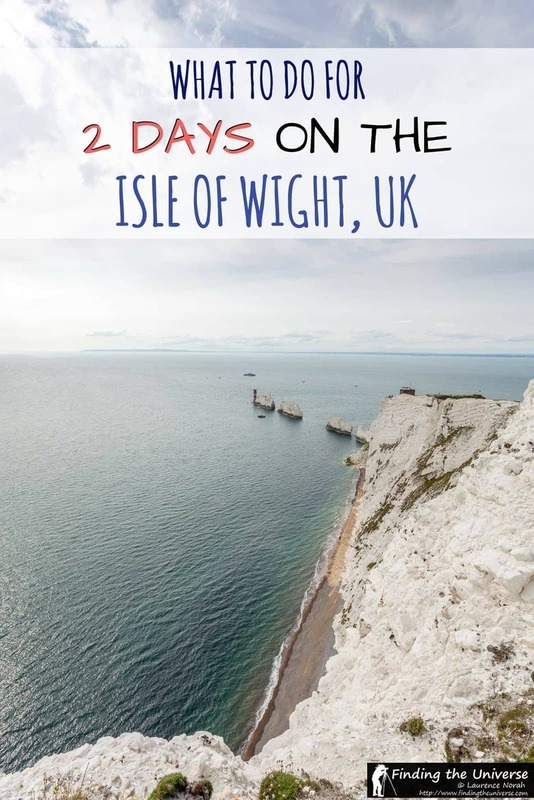 And one of the places that we’d both been wanting to visit for a while was the Isle of Wight, a relatively small island which sits just off the south coast of England, near the town of Southampton. Well, we finally made that happen. In today’s post, I’m going to share with you our favourite things to do on the Isle of Wight. We’ve set these out in the form of a 2 day Isle of Wight itinerary, but you can of course pick and choose these to form the basis of an Isle of Wight day trip, or a longer stay on the island. 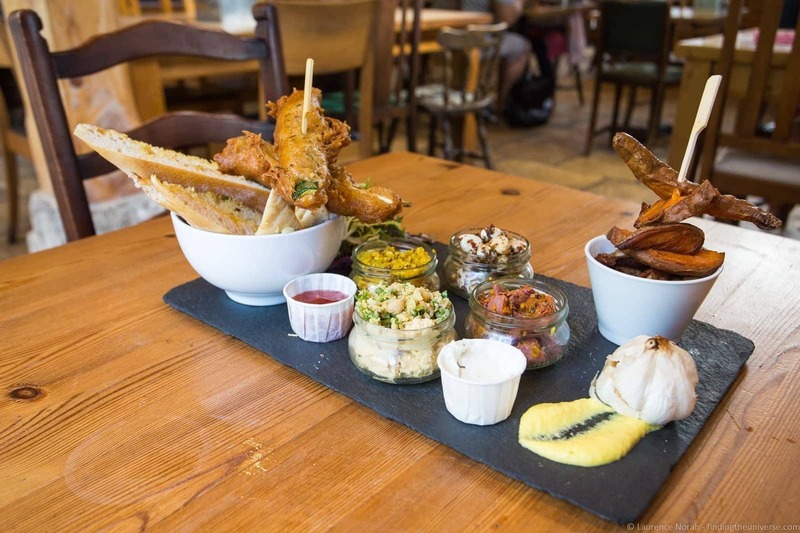 As well as including our favourite places to visit on the Isle of Wight, this post also lists some of our favourite restaurants on the Isle of Wight, and all the practicalities you need to plan your perfect visit to the Isle of Wight . This suggested list of places to visit on the Isle of Wight would fit into a two day itinerary as outlined below. 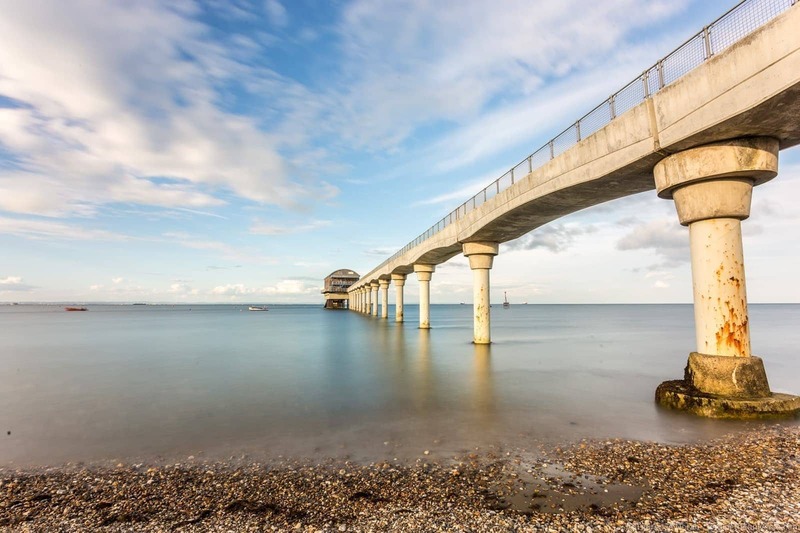 However, you could pick and choose some of these to create an Isle of Wight day trip itinerary, or expand your stay for more days depending on your schedule. Our first day on the Isle of Wight has you starting on the north side of the Island in the town of Cowes, which is one option for taking a ferry to the island. If you’re coming from Portsmouth, then you can take the ferry to Fishbourne. Our first stop on the Isle of Wight is the town of Cowes, where we would suggest you stroll. Cowes has lots of shops and eateries, and is where the annual Cowes Week sailing regatta takes place – one of the largest sailing events of its kind in the world. Cowes is a good place to have bite to eat to set you up for your day of exploring. One of our favourite places to grab do that is the HK Cafe Bar and Bistro, found right on the high street, which has a great selection of tasty, locally sourced options. 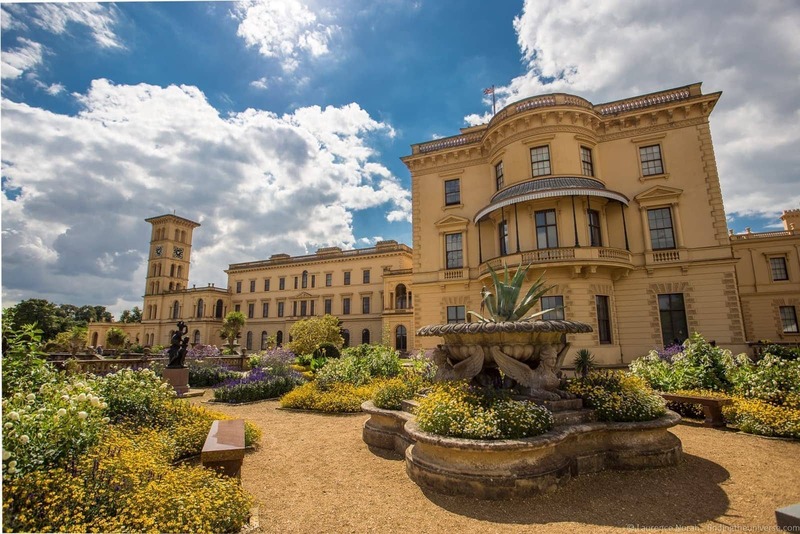 Osborne House is one of the most popular attractions on the Isle of Wight, and for good reason. This beautiful Italian Renaissance style home was the summer home and rural retreat of Queen Victoria and Prince Albert, and was where Victoria spent extensive time in mourning after the death of Albert in 1861. It was also where Queen Victoria died in 1901. As you can imagine, there is plenty of Royal history to learn about at this incredible property, which covers a large area and includes a private beach, a full size “Swiss Cottage” that was imported from Switzerland and a number of garden and woodland areas. You could spend a lot of time at Osborne, especially on a nice day, but we’re going to suggest that you just allocate the morning to your visit and focus on the house itself, as well as the Swiss Cottage and the beach area. Osborne House is operated by English Heritage and there is an entry fee to get in. It’s free for English Heritage members or visitors with an English Heritage Overseas Visitor Pass. If you’re not a fan of garlic, this might not be the place for you. For the rest of us who love garlic though, the Garlic Farm is heaven on earth. This family run operation is home to, as the name suggests, a Garlic Farm, but there is much more to do here than just watch garlic grow. Our suggestion would be to schedule your lunch stop at the Garlic Farm, where they have a restaurant that serves all things garlic. In particular, we suggest the Garlic Mezze Platter, which has enough garlic-based items to satisfy even the most die-hard garlic fan. Then, finish off with some delicious black garlic ice cream! There’s more than a restaurant here though. There’s a store where you can buy all manner of garlic based products, a tasting room, where you can try many of those products before you buy, and you can even take a tour of the farm and learn all the secrets of garlic growing. We really enjoyed our lunch and visit to the Garlic Farm, and are sure you will too! Monkeys! Who doesn’t love these little fellas? We certainly do, so a trip to Monkey Haven was a no-brainer during our visit to the Isle of Wight. 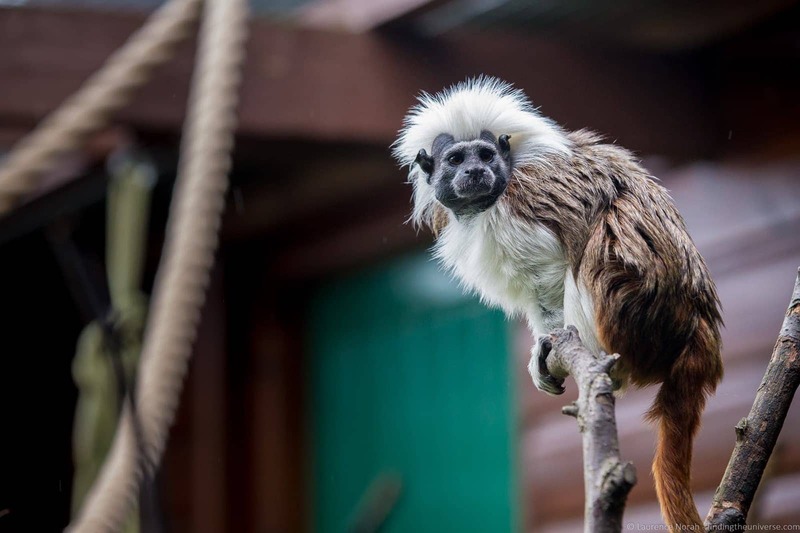 This sanctuary is a home for rescued animals, adopted by Monkey Haven for various reasons, including being saved from the illegal pet trade, private owners, or who were injured in the wild and would not have survived. Today these animals live in a relaxed environment away from the stresses of their previous lives, and you can visit them! Despite the name, there are also many more animal species here than monkeys, including birds (particularly owls), meerkats and reptiles. We enjoyed meeting and learning about the lives of these animals, and the talk on owls was particularly good. This is an excellent stop especially if you’ve got kids! Love old trains? You’re going to go nuts for the Isle of Wight Steam Railway! This largely volunteer run heritage railway has 5.5 miles of track on which lovingly restored steam locomotives and diesel engines offer rides, harking back to the glory days of rail transport on the Isle of Wight – a history which started in 1862, and in its heyday, boasted 55 miles of railway connecting the islands towns and villages. For over forty years the Isle of Wight Steam Railway have been preserving this history. 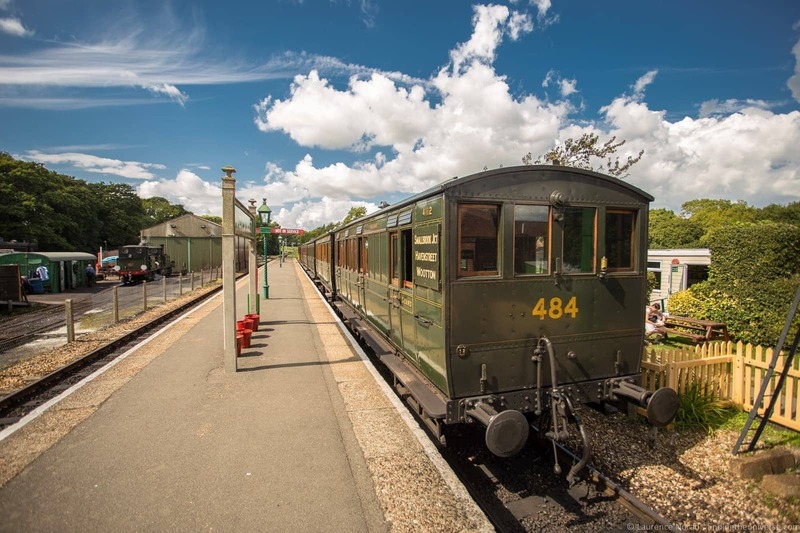 As well as taking a ride in a classic vintage carriage pulled by a steam locomotive, you can visit the Carriage Shed and learn all about the history of the railway on the island, as well as see equipment being repaired and restored. The focal point of the Steam Railway is Havenstreet, which is where you can buy tickets, visit the main attractions and pick up rail themed gifts in the well stocked souvenir shop. This is definitely an attraction that will appeal to all ages, and is an excellent way to round off your first day exploring the Isle of Wight! 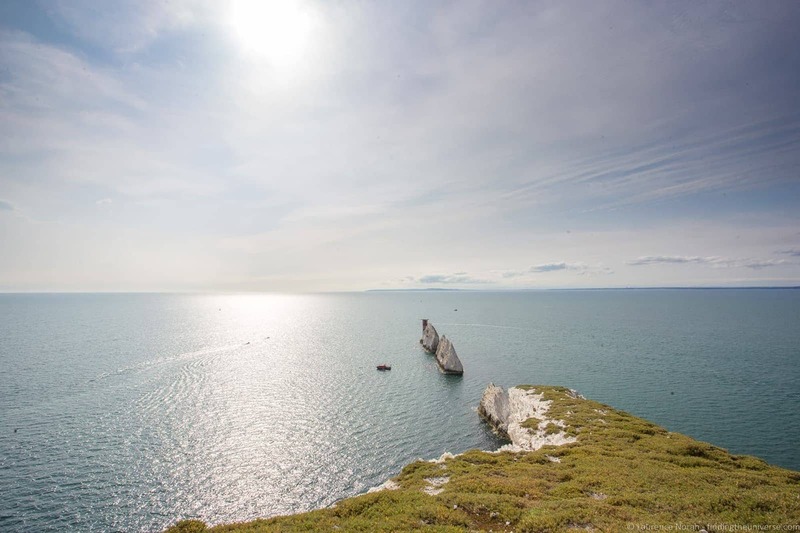 The Needles are a series of chalk rock stalks which jut out into the sea on the far western tip of the Isle of Wight. This chalk ridge actually extends all the way under the water across to the county of Dorset on the southern English coast. Designated as an area of outstanding natural beauty, the Needles are a really beautiful sight and are perfect for photography. Plus, there’s more to do here than admire the view, wonderful though it is. The two main attractions next to the needles are the gun batteries at the point by the needles, and the experimental rocket testing station at the top of the hill. The Battery is operated by the National Trust and there is an entry fee (free for National Trust Members or if you have a National Trust touring pass). Here you can learn about this Victorian Coastal defence which was the site of an artillery battery, operational from the 1860s through to decommissioning in 1954. This is also a great spot for a view of the Needles, plus there’s an on-site tea room decorated in a 1950s style. A little up the hill from the Battery is the rocket testing station, which played a vital role in the development of Britain’s ICBM capability, being the site for numerous rocket test firings between 1956 and 1971. 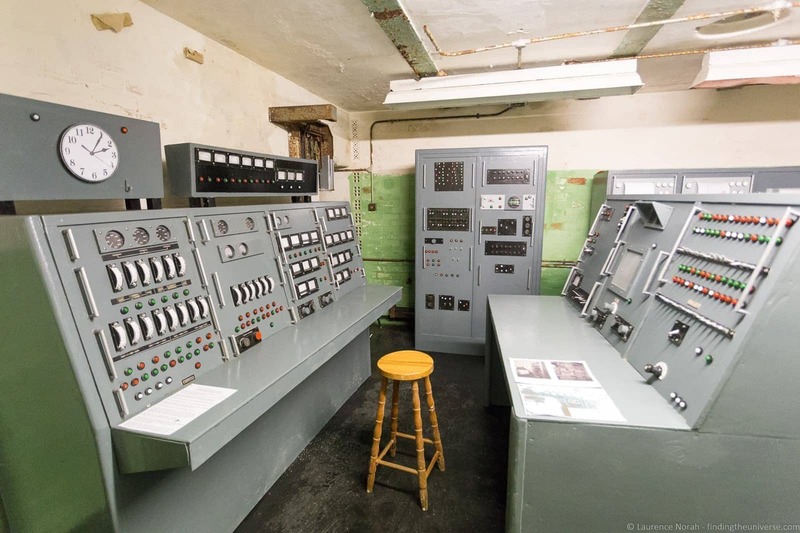 At it’s peak of operation, 240 people worked at this top secret complex, and you can visit this part of the site for free. From the top of this hill there’s also an excellent view of the Needles themselves. 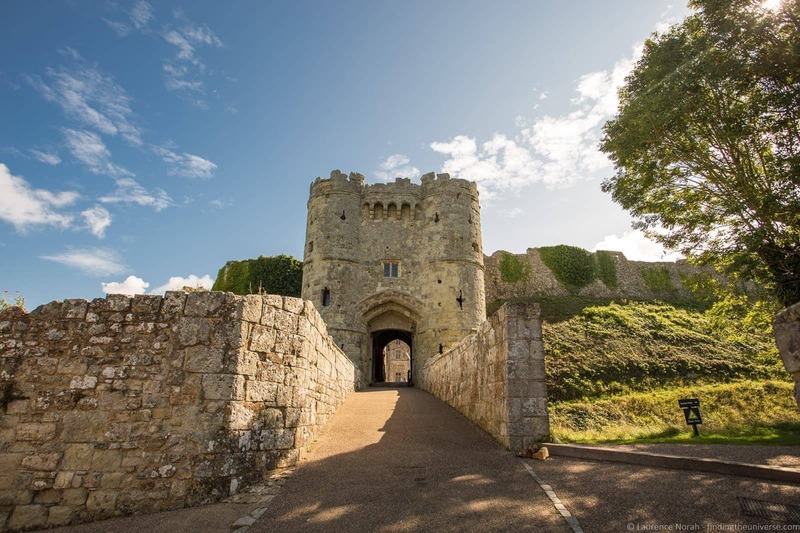 We’re going to head to the centre of the Island now, and visit the impressive 12th century Carisbrooke Castle. This was the primary defensive fortification on the islands for hundreds of years, fending off the French in the 14th century and being the prison of King Charles I for fourteen months prior to his execution in 1649. Today, the castle is operated by English Heritage, and along with Osborne House, is definitely a must-see sight on the Isle of Wight. You can climb the walls, meet the donkeys, explore inside the chapel, see where King Charles I was imprisoned, and much more. It’s an impressive and imposing building, and again, you could spend a good few hours here exploring. We’d suggest bringing a picnic or taking advantage of the on-site tearoom for lunch today. As this is operated by English Heritage, there is an entry fee to get in. It’s free for English Heritage members or visitors with an English Heritage Overseas Visitor Pass. Back down to the south coast now, and a visit to Blackgang Chine – the oldest amusement park in the UK. 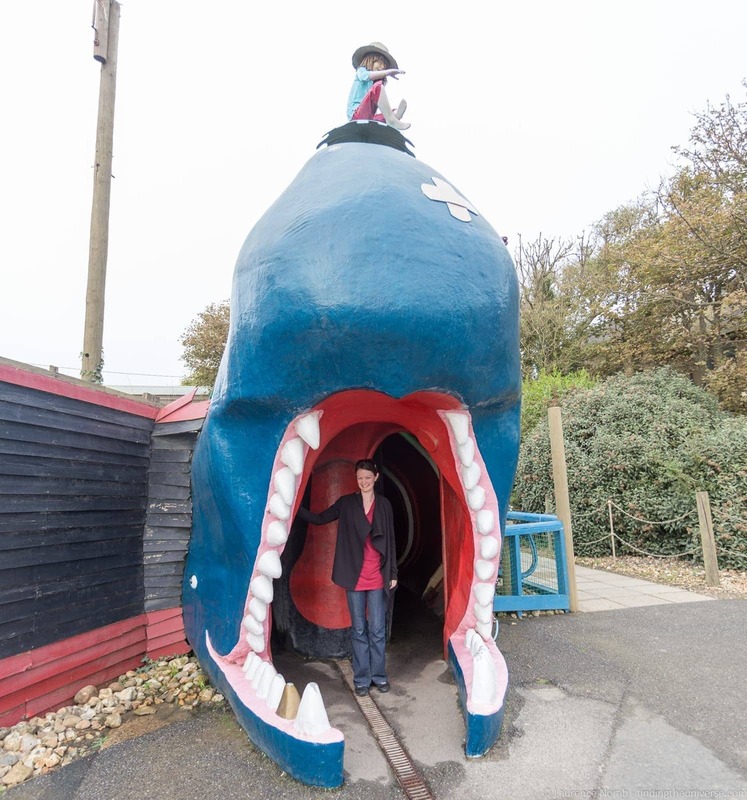 If you like old-time amusement parks and / or are travelling with kids, then you should definitely include a stop here on your Isle of Wight itinerary. There are rides for every age, a waterpark, a hedge maze and even a huge whale skeleton! Something for everyone, and definitely a lot of fun to be had here for the whole family. Just up the hill a little from Blackgang Chine is a parking spot for St. Catherine’s Down. From here you walk out to a viewpoint for lovely coastal view, or take a short ten minute hike up to St. Catherine’s Oratory. 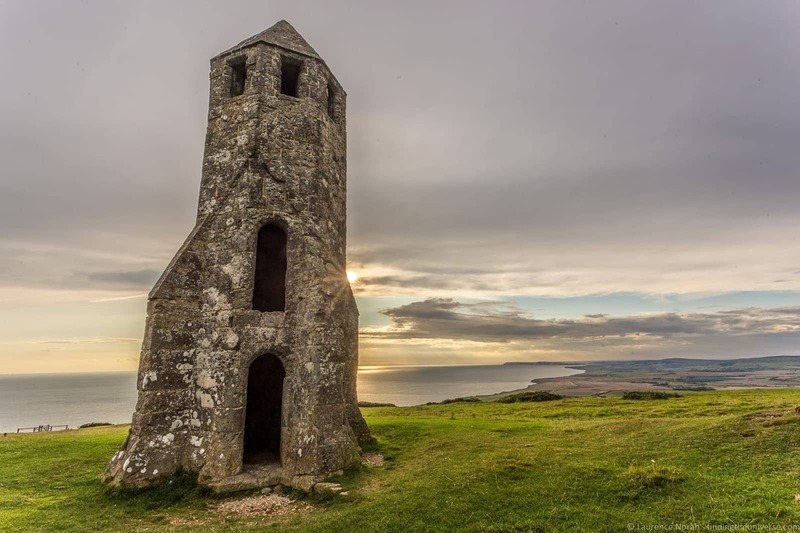 This strange building, which looks a bit like a rocket-ship, is actually a medieval lighthouse dating from 1328, and is Britain’s only surviving medieval lighthouse! The building itself is impressive enough, but it’s the views that you really come for, as the building is situated at one of the highest points on the island. It’s operated by English Heritage, but access is free. You have to walk across a field to get here, so good walking shoes are recommended. As you continue along the southern coast of the Isle of Wight heading east you will pass a number of cute towns including Ventnor, where there is a lovely botanic garden. 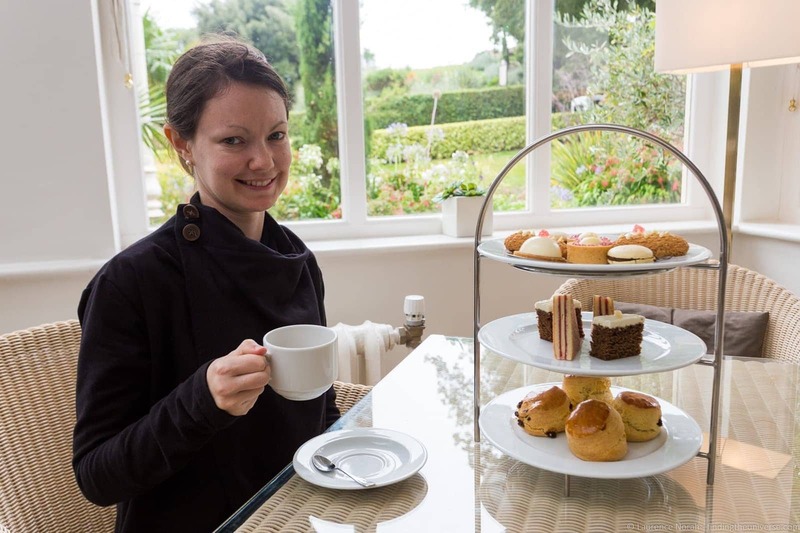 There are also two hotels offering an excellent afternoon tea in Ventnor, the Hamborough and the Royal Hotel, so depending on your timing and interests, these would all make for a good stop. There’s also a lovely beach at Steephill Cove with a variety of cafes, which is just below the Botanic Garden, accessible on foot only. Again, depending on your interests and schedule, these are all excellent stops. 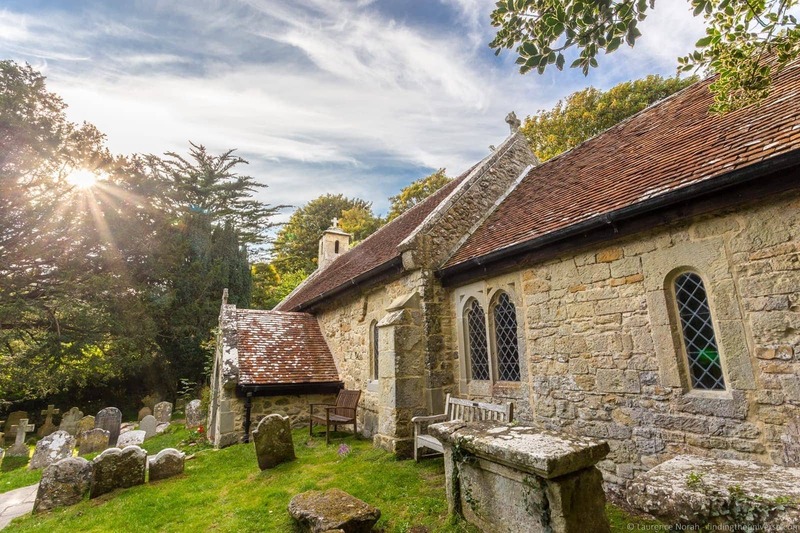 One stop that we definitely recommend you do include on your trip is Old St. Boniface’s Church in Bonchurch. This is a really cute little church which dates from the 11th century, and is one of very few medieval churches in England dedicated to this Saxon monk. It’s only a short stop, but a worthwhile one. Our last attraction on the final day of our two day Isle of Wight itinerary is the picturesque town of Shanklin, which has beautiful beaches, cute thatched cottages and one of the island’s most enduring visitor attractions: Shanklin Chine. 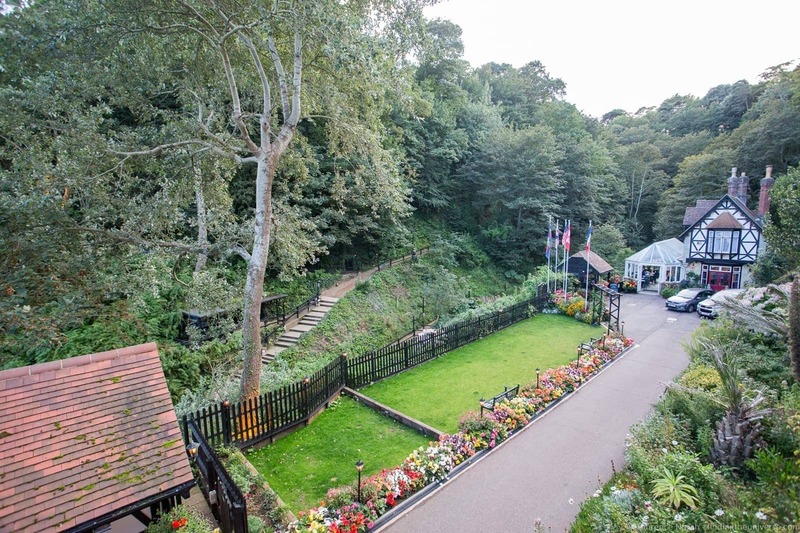 In 2017 Shanklin Chine celebrated its 200th year of operation, making it the oldest visitor attraction on the island! You might at this point be wondering what a “Chine” is. Well, it’s a narrow gully or gorge. And that is exactly what Shanklin Chine is – a beautiful, tree lined gorge which you can wander through and enjoy views that inspired artists from Austen to Turner. Shanklin Chine is open relatively late during the peak season, and is also lit up at night. There’s an entry fee, see full details on opening times and pricing here. And that summarises our suggestions for a two day stay on the Isle of Wight! Now, let’s look at some practicalities for your visit. Just off the south coast of England, the only way to get to the Isle of Wight is by hovercraft or ferry. The closest airport with public flights is at Southampton, although there are airports for private aircraft on the Isle of Wight if that’s how you roll. Most people will be taking the ferry or hovercraft to the Isle of Wight. Fun fact, this is one of the more historic ferry routes in the UK, with a passenger ferry to the Isle of Wight operating as far back as 1420! The main decision you have to make is whether or not you will be taking a car with you. For our suggested itinerary we highly recommend having a car, so either you will have your own car, or you will rent one. Car rental is available on the Island, so you can save a bit of money by picking up your car on the island rather than paying to bring one on the ferry. 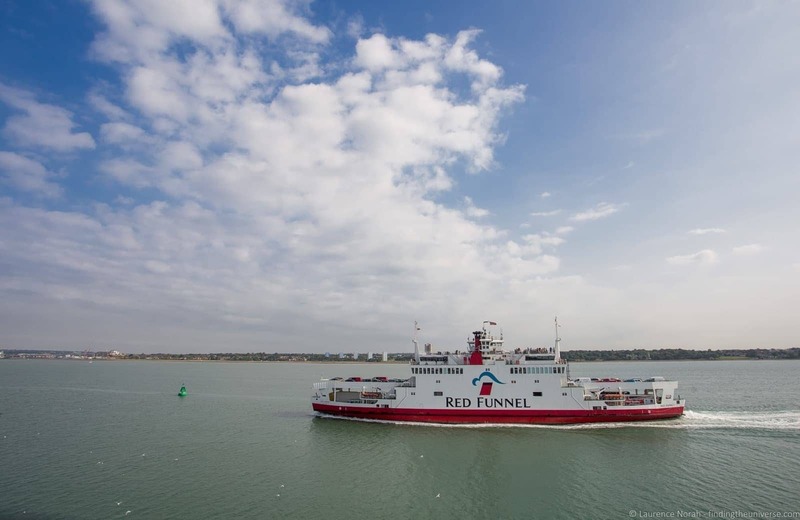 From England, ferries operate from Portsmouth, Southampton and Lymington, arriving on the island at Fishbourne, East Cowes, Yarmouth, Cowes and Ryde. The hovercraft runs from Southsea (Portsmouth) to Ryde, and is the only operational passenger hovercraft in the UK. There are three companies operating services – Hovertravel operates the hovercraft, whilst Red Funnel and Wightlink are the two ferry companies. We took the Red Funnel car ferry from Southampton to East Cowes which took around an hour each way. The boat is large and comfortable, with a café on board and there are lovely views as you journey to the island. As a rule the car ferries are slower than the foot-passenger only services, which take between 10 minutes and 25 minutes. See more about all the various transport and connection options on the official Isle of Wight website. There are a lot of accommodation options on the Isle of Wight, so will have plenty of choice. The island is also not too big, taking around half an hour to drive from the north coast to the south coast, so you will be able to get to all the locations on our two day itinerary from wherever you choose to stay if you have a vehicle. For our two days on the Isle of Wight, we stayed in the town of Ventnor on the south coast at The Hambrough Hotel. 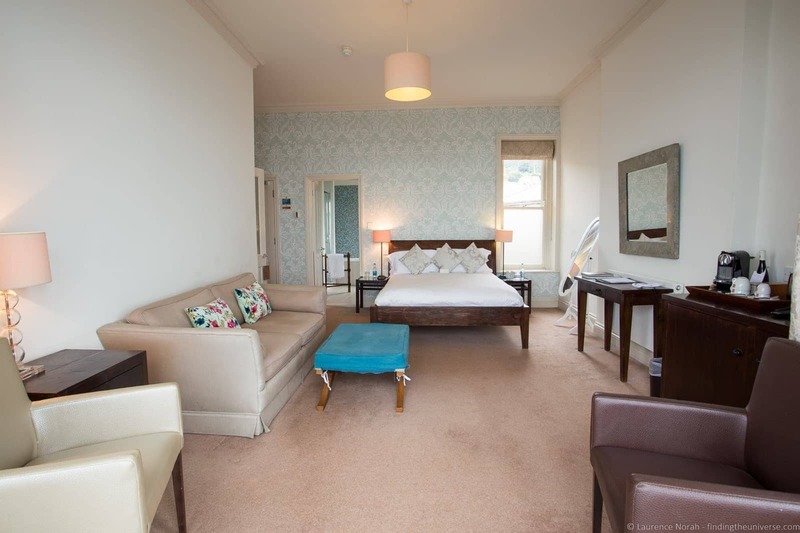 This gorgeous luxury boutique hotel offers large, comfortable rooms, the majority of which have spectacular sea views. This came with a fabulous breakfast featuring locally sourced ingredients, and we also took advantage of their afternoon tea and dinner service here where the food was truly excellent. The evening meal in particular was very notable, with Head Chef Luke Taylor offering a truly exceptional fine dining experience that rivalled some of the best meals we’ve eaten on our travels. Reservations are definitely needed for that. 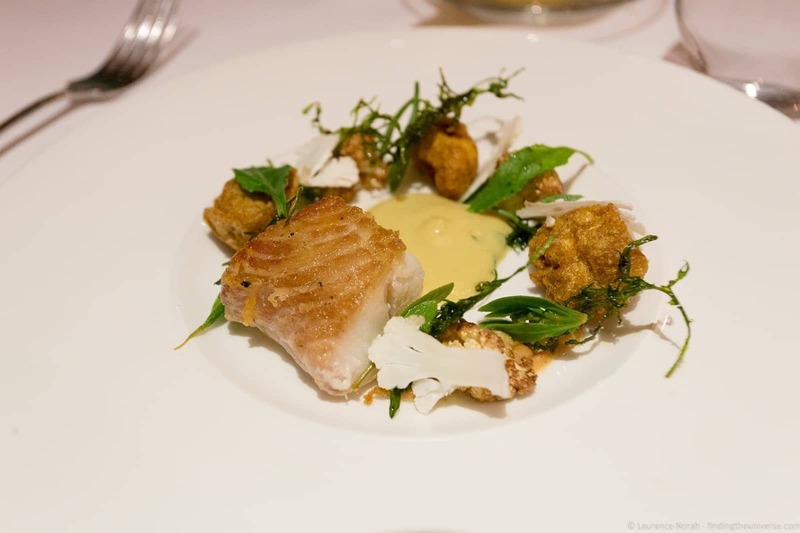 So we can certainly recommend The Hambrough – see here for reviews and the latest prices. 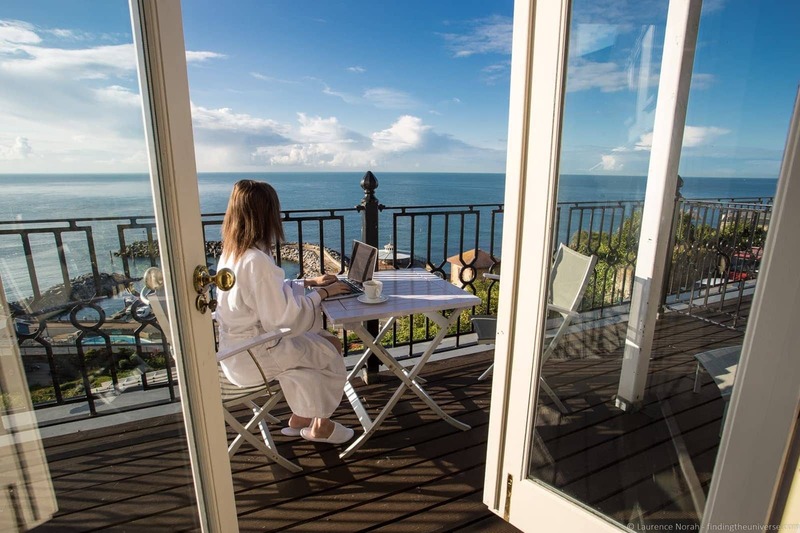 Otherwise, there are numerous properties to choose from, check out the Booking.com listings for hotels on the Isle of Wight to give you plenty of choices and the best deals. Of course, there are other options for accommodation on the Isle of Wight, including AirBnB. If you’re new to AirBnB, you can get a discount off your first stay with this link. There’s no shortage of places to eat on the Isle of Wight, with everything from fine dining to quick bites available. Some definite highlights of our visit were our evening meal at The Hambrough, our afternoon tea at the Royal Hotel in Ventnor and our lunch at the Garlic Farm. 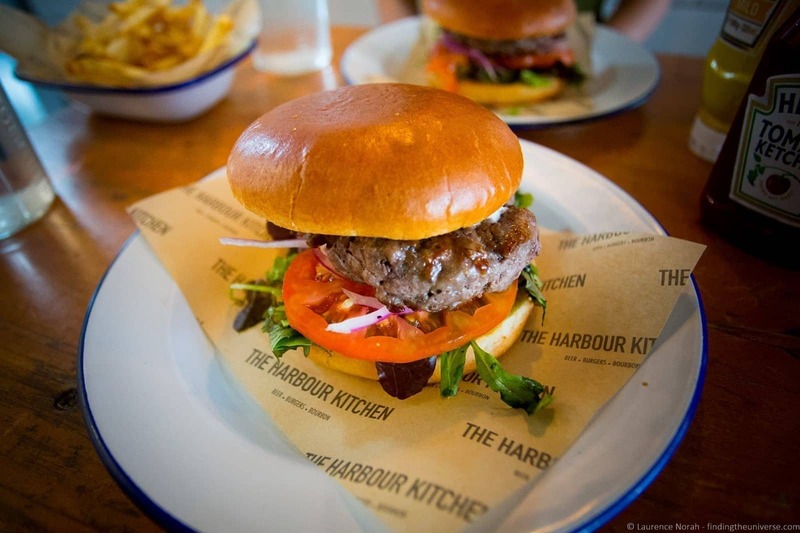 We also really enjoyed the burgers at the HK Cafe Bar and Bistro in Cowes if you’re looking for more casual dining. Our suggested way to get around the Isle of Wight is by car. This will give you the greatest flexibility and let you see the sights at your own pace, plus stop where you want for sight-seeing or photo opportunities. If you need a hire car, you can compare prices here. 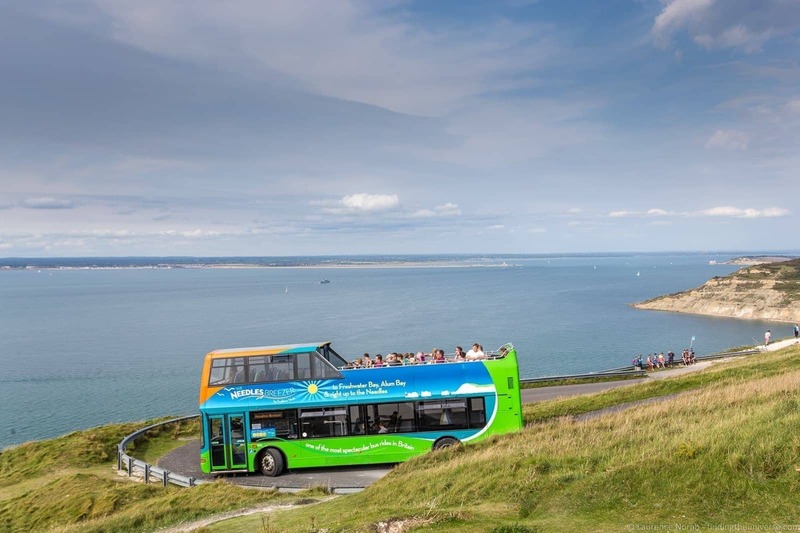 If you’d prefer not to drive yourself, there is a well-connected public bus service on the Isle of Wight as well as a tourist focused hop on hop off bus which runs around the islands coast. There’s also the “Needles Breezer” service which will take you all the way out to the Needles from the town of Yarmouth. For more on the various transport options on the Isle of Wight, check out the transport section on the official Visit Isle of Wight website. Just be aware that public transport runs to a timetable, and you may have to adjust our suggested itinerary depending on available services and schedules. We would suggest that the months of May to September are going to be best for visiting the Isle of Wight. The weather will be more favourable, and most attractions will be open daily (although always check each individual attraction for opening information before visiting). One event to be aware of when planning your visit to the Isle of Wight is Cowes Week. This is one of the most famous events in the world sailing calendar, and takes place over a week in early August every year on the island. As well as all the sailing there are a number of other activities including live music, fireworks, a family day and more. It’s a really busy and exciting time, and without doubt one of the most popular times to visit the island. We certainly think Cowes week is a fun experience, but if you’re just visiting the island for sight-seeing and don’t have an interest in Cowes Week, do be aware that accommodation at this time will be more expensive than at any other time of year, and traffic levels will be increased. 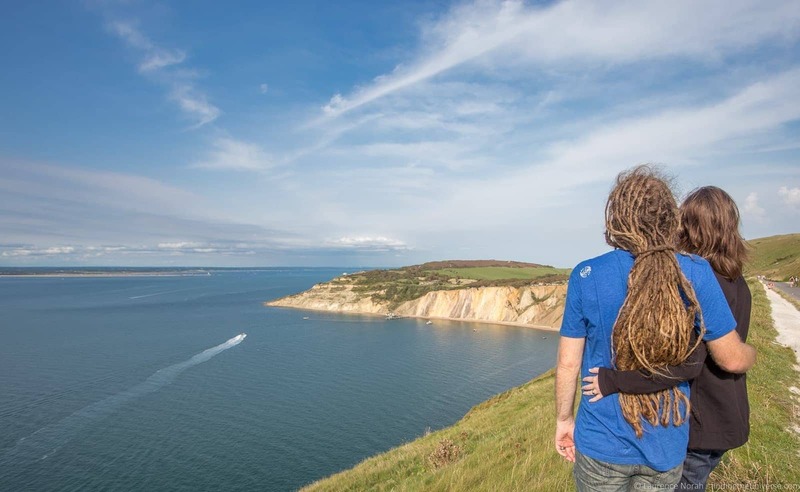 If you do want to visit outside the main tourism months, check out this handy guide to what’s on year round on the Isle of Wight, including attractions that are open throughout the year. If you’d rather not plan everything yourself, and want someone else to drive, then we can recommend that you take a tour to the Isle of Wight. Our recommended tour is this three day tour from London, which as well as the Isle of Wight also includes a number of attractions on the south coast of the UK. Another option is this one day tour to the Isle of Wight, also from London which will take you to the major sights on the island. And that sums up our suggested guide to things to do on the Isle of Wight! Here are a number of resources you might find useful to help you plan your trip to the Isle of Wight and the wider UK. 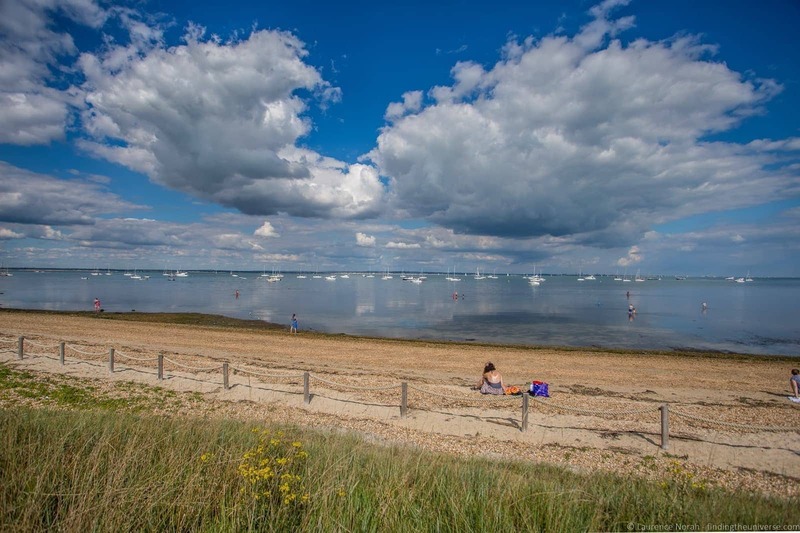 The official Isle of Wight tourism portal, which has loads of ideas on what to do, where to stay, transport information as we as all the latest event information for the island. If you’re interested in getting better photos when you travel, take a look at my online photography course, where I’ll teach you everything you need to know about getting better photos – whatever camera you have! And that sums up our post on what to do on the Isle of Wight! As always, we’re open to your feedback – if you’ve got must-see suggestions for the Isle of Wight, or have any questions about a visit, just let us know in the comments below! So you know: we were hosted for two days by Visit Isle of Wight, who covered our accommodation, meals, ferry to the Isle of Wight and attraction entry. We covered our own transport on the island and additional expenses. As always, our opinions remain our own, see our code of ethics for how we choose who to work with. Thanks Laurence. Can you give me the name of the local tourism group who can help me with my enquiries please? Thank you for your very informative site. I am interested in ancient castle ruins. I am told that our family Seyfang had a castle somewhere on the Isle of Wight. any ideas how i can find out anything about it? i belive it is a ruin now. thank you . 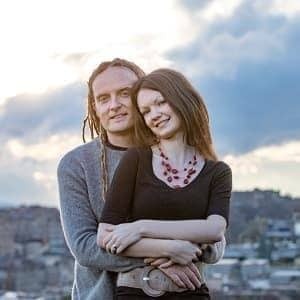 i plan to visit in 2019 september all being well.